SnuggleBundl was created by David Solomons, whom when his baby was born, his wife experienced problems, and he had back problems. He would snuggle his baby into a blanket and lift her up that way, therefore making lifting baby easier for them both. In 2011 he teamed up with his neighbour Mike Edwards and his wife Heidi and created the SnuggleBundl. 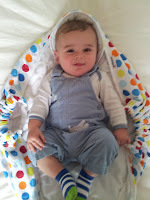 As you will know if you have read my About Us section, Jack has reflux; I had seen a review online that a SnuggleBundl is not only a good way to carry but a help for reflux also. This is as the Bundl keeps the baby in the same position therefore not tipping them when transfering. This was one of the reasons I opted for a Bundl, the other was because when you attempting to move Jack when sleeping he would wake and stay awake. 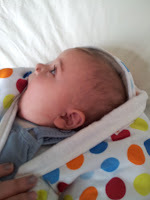 I can truly recommend the SnuggleBundl as it is a simple way for me to move Jack when hes sleeping and helping him to stay asleep. 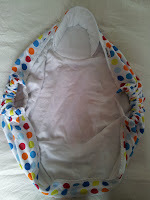 The Bundl is a great way to transfer your sleeping baby, or even awake baby without much effort, and without disturbing. 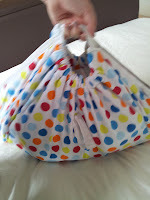 As the Bundl was created to help with Back Problems obviously it is a good help for this. If any parents/guardians already have a Back Problems, or problems which prevent them from bending down, the Bundl helps with this. It prevents you from bending over to lift the baby. SnuggleBundl also won a Gold Award from LovedByParents for Best Innovative Gift. The SnuggleBundl is extremely easy to use. The following information is taken from SnuggleBundl website. 2. Fold any excess material over your baby's feet if required. 3. Wrap your baby by folding the left side over the right and tying the ribbon through the top handle. 4. The hood should always be rolled back when the baby is horizontal in the BUNDL. Also roll and fold the material away from the face. Note - Always ensure that your baby is not to hot when fully wrapped. Adjust accordingly to the surrounding conditions and temperatures. Always ensure you can see your baby's face." The Bundl comes in a choice of Rainbow or Spotty on SnuggleBundl website, however I have also seen it sold in Pink, Brown and Blue. 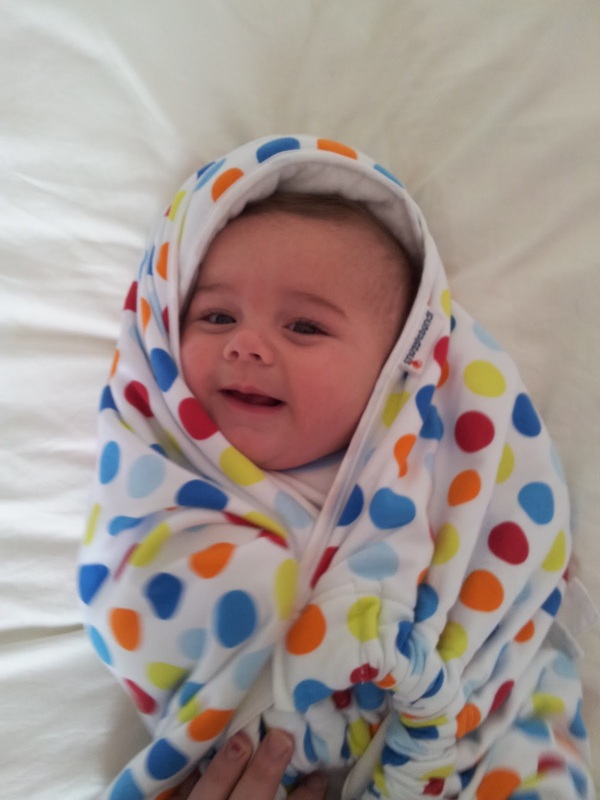 The SnuggleBundl is made from Jersey Cotton, suitable for use all year round. 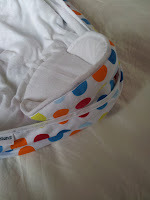 The Bundl is machine washable and tumble dryer safe, so easy to wash and dry. It is also long lasting as it is suitable from NewBorn to roughly 9Months, (upto a weight of 30kgs, 66lbs). I wonder if they will start producing them in South Africa. The pound exchange rate is pretty steep at the moment. It would make a wonderful venture for the ladies without work to get involved in.